Un innovador modelo social y económico, para llevar al ser humano a su siguiente paso evolutivo. All the opinions must be considered. Regardless of who makes them, no matter if the person comes from the right-wing, from the left-wing, or whatever. The dialogue must be with the purpose of getting to an agreement, not just for making catharsis of an individual point of view. The collective welfare must be the purpose, and the way to get there, it must be non-customized using the scientific method. That is, showing proofs of what’s been said. A. “There is not enough money to apply the measure”. We agree that there is money, but it is wrongly distributed, in corruption, overprice and, unnecessary things like the war. We have more than enough money, for everybody. B. “It is not fair that someone who is not working gets an income”. 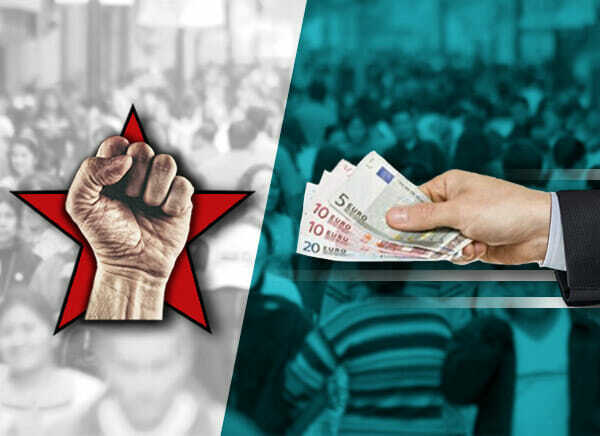 We agree, but that expression comes from the human being selfishness because there are many groups who get billions of Euros without doing nothing, the landlords exist, and there are no demonstrations against it. C. “Call effect”, this is totally true, and since we cannot change all the governments of the world at once, the necessary rules must be done to avoid being filled up with foreigners. 1. Do not give money, but goods: and here, I can only wonder, since when it’s said “The State provides education and health care, directly to the beneficiary” My fellows, the State doesn’t create the materials for the analysis, it doesn’t even create the medicines. And as this basis is fake, everything falls. Now is there going to be someone who tells me what I should eat? Are we going to create more bureaucracy to control this? The State doesn’t make the food. Who ensures that those food contracts are not overpriced? Why is someone else going to decide for me, what should I eat, how much and how to eat it? We are talking about deep basis problems at this point, we all are fascists. Besides, what is the problem with the good capitalism? Are we going to stand up now for a communism that failed in the whole world? That is why it is important to understand this article, the 2 fundamental laws of the economy. Moreover, the BI that we call Universal Minimum Income UMI, must be variable as per the welfare that collectively we are achieving, like a prize-punishment conduct, for the good or bad social behavior. With a mediatic campaign aligned with it. The USA has been printing billions of additional dollars for a decade and from nowhere, each year, and its inflation is just of 3-4%. As per the college economists, the inflation that should exist is just of 2 digits. There is an inflation in the USA of two digits in the real properties, but this topic is long to discuss it deeply. The definition of the amount of the BI is necessary. Because the scenario is different if it is 600€, or 2000€. Because with 600€ you can survive, but not live. 4. The BI as a subvention for the companies: Here it is argued the opposite of what was said in the previous point, about people would leave the employments that are paid badly for getting better ones. To clarify this point it is necessary defining well the amount of the BI. What is the problem if the money is given to the people and not the companies? Indeed, nowadays we do the contrary, we pay the companies, rescuing them, and lowering the taxes so that they can pay miserable salaries to the employees. The best thing should be giving the money directly to the people, rather than to the company. And then they can spend the money in whatever they want, as long as they don’t damage the society, which is the source of money. Do you know how much money the military force cost? Just the OTAN is around 2% of the GNP, and it is not the only military expense. And forget about the over prices and the general corruption that there is still going at any level. 6. It is correct, the accounting technical details must be well analyzed and its arguments must be totally scientific, with the data in the hand, statistics, trends. If we make the BI more difficult and bureaucratic, then we will undermine what we want to do. It is way much better finding a solution to the housing problem, defining well the purpose of what we want to achieve, by applying the 2 fundamental rules of the economy, and understanding well the supervisor problem, giving an authentic freedom without falling into impositions and other common selfish expressions, to create a system without the traditional failures of the past. In another article, I will discuss better a proposal on the housing topic, since it is more complex than it seems. Because we must consider that we tend to live much more years than the natural. And hence, we must adjust the housing to that reality. Competition in Natural Monopolies eliminates Bureaucracy. What do we really know about nuclear energy? Centralized Decentralized and Distributed, from the Pyramid to the Circle. Telegony, the social atomic bomb that explains this violent society. 3rd Mail: The knowledge of Money gives us Freedom.